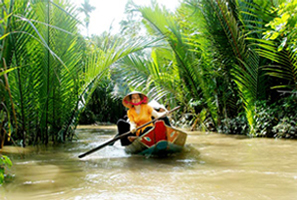 MyQ Vietnam – a part of MyQ Safari – has various areas with many different styles. 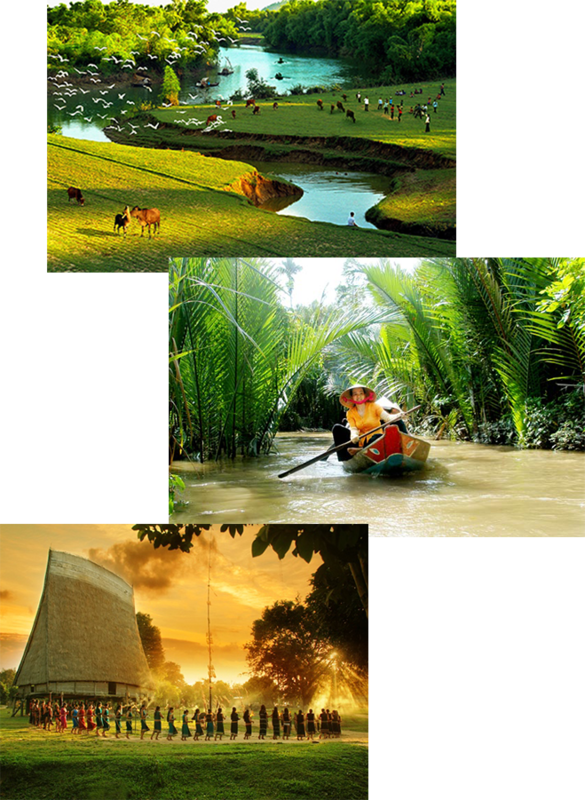 While MyQ Africa makes you feel suspenseful and passionate with spectacular wild Africa, MyQ Vietnam provides a feeling of looking back to the past into traditional culture of Vietnamese villages where nature, animals, humans live together harmoniously. 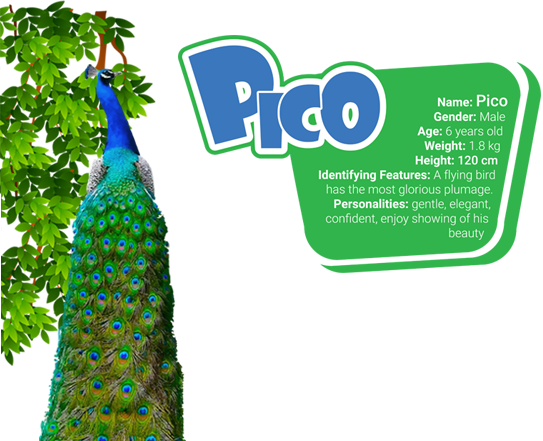 Hello everyone, my name is Pico. 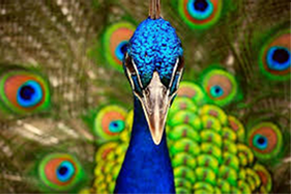 The thing that peacocks are best known for is not their tail, it is their train – their tail coverts. My train is so beautiful, isn’t it? My beautiful train is only used to show off for a pretty peahen. My train is grown perfectly on summer and dropped on autumn. Even though my train makes me proud, my voice let me down. My mom said that when making voice for peacock, The Creator accidentally gave too much high sound so nowadays, the peacock’s call sounds like a human crying for help. 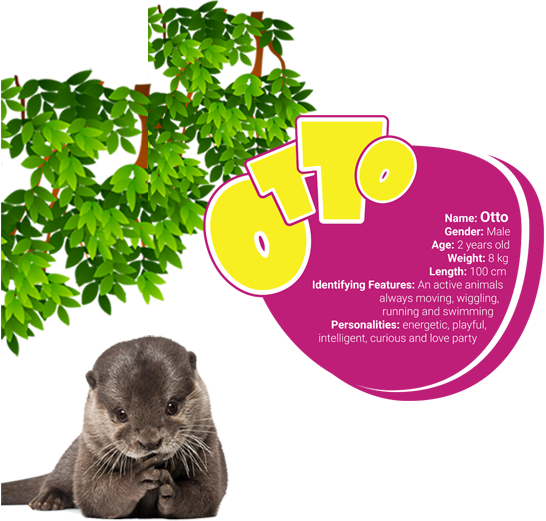 Hello, my name is Otto. I like to swim on my back, throw and bounce things and play games of tag and chase. I can easily touch my nose to my tail because otters are quite flexible.
. I have 2 layers of fur: a dense undercoat that traps air and a topcoat of long, waterproof guard hairs. 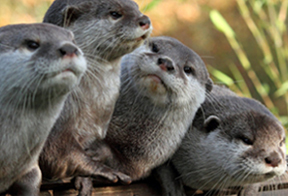 If otter’s fur becomes matted with something like oil, it can damage our ability to hunt and stay warm so it is important for us to keep our fur in good condition. 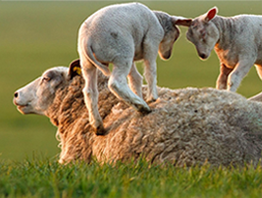 I usually clean my fur by biting and scratching it or rubbing and rolling against grass, rocks or logs. My long sensitive whiskers can detect water current changes as well as the presence of prey or potential predators lurking in the water. Hello everyone, my name is Sube. The Sun Bear is the smallest of the world’s eight bear species so we have a special ability that is climbing tree. I like sunbathing on those high branches and eating honey. Sun Bears do not hibernate like cold-weather bears, probably because our tropical habitat provides food sources year-round. We have an incredible sense of smell, thought to be several thousand times better than that of humans. 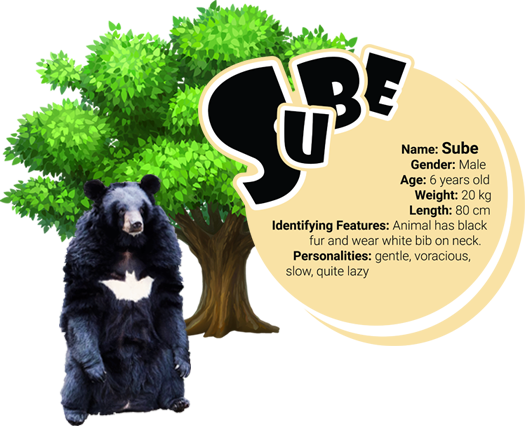 The Sun Bear has various name, such as: Dog-face bear, Malay Bear and Honey Bear. 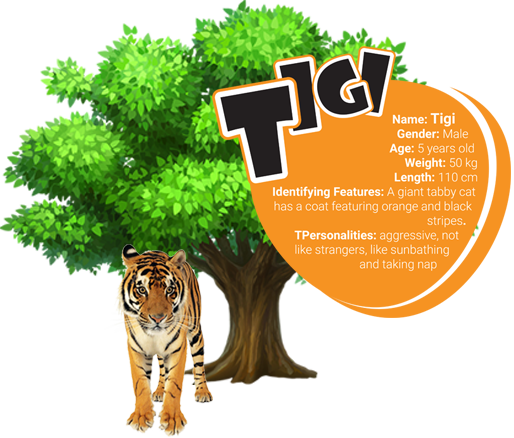 Nice to meet you, my name is Tigi – the youngest tiger in MyQ Safari. You might think that all tiger look the same but the fact is that each tiger has its very own stripe pattern. I am well-known as an excellent swimmer even though I am a cat. I am also famous as an excellent hunter who is not only fast but also strong. I can hunt a prey that weighs nearly four times my own weight and carry something twice my own body weight 3 meters up a tree myself. I’m so proud that the tiger was voted the world’s favorite animal by viewers of the Animal Planet TV show. 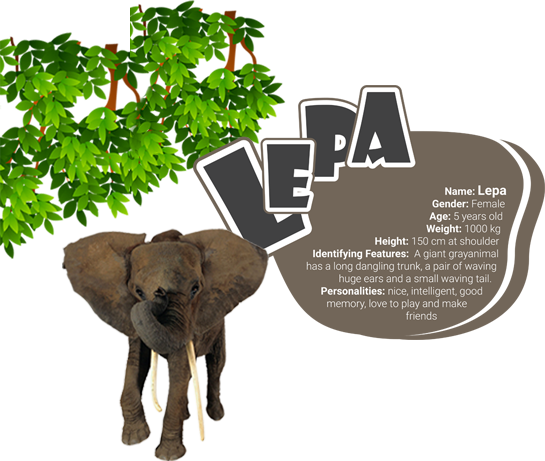 Nice to meet you, my name is Lepa. I am so proud of my trunk. It is so strong that it can push down trees and so agile that it can pick up a single piece of straw. I use my trunk to eat and drink, do greeting, have shower, breath, touch, pull and push, etc. You might think that I am not smart because I am slow and lazy. The fact is that an elephant is smart enough to recognize itself in a mirror and if it is trained, it also can draw. Even though my skin is thick, it is so sensitive that I can feel a fly landing on it. My herd is made of females and their offspring. The leader is a oldest and most experienced female in the group. Once male elephants are old enough, they have to leave the herd. 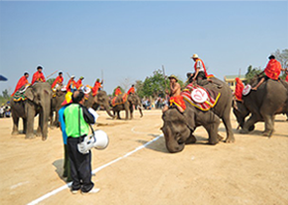 Circus: We bid chargeable circus business at My Quynh Safari. 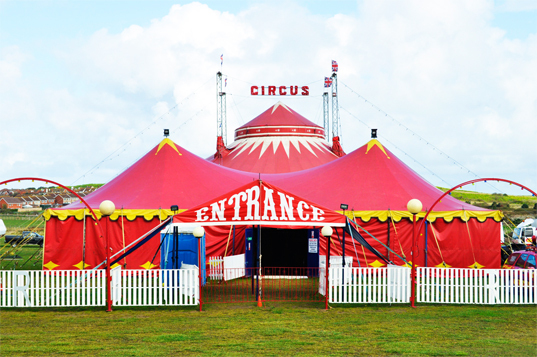 The circus can regularly organize animal shows at the perfect stage which we have built. Circus business can easily bring high turnover for investors because circus is an extremely prominent attraction in the Safari. Bicycles for hire: Due to the very large safari, we have put several bicycle stations with limited number of bicycles for visitor to hire and cycling around the safari. 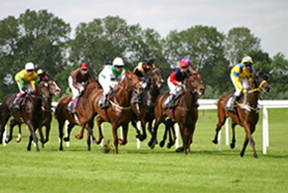 We bid this service – a simple management business can generate attractive revenue. 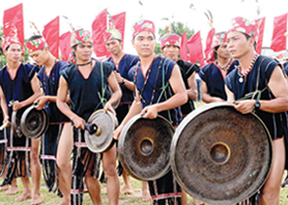 Traditional costumes for hire: Wearing Vietnamese traditional costume at the northern village, the southern village and the highland village is extremely interesting experiences with visitors. 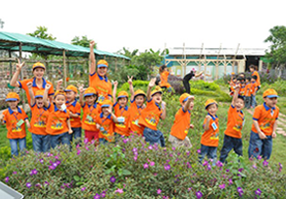 We welcome potential partners who provide and manage this service at My Quynh Safari. Immediately taken photograph service: We welcome investors bid entire this service at the Safari. Photography service suppliers can provide all photographers in the Safari. We guarantee that there is no individual freelancer competing with the bidding photography service suppliers. Photography service suppliers can also be the traditional costumes service suppliers. Other services: If you have other services in accordance with the safari, do not hesitate to contact us. 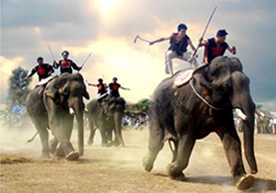 MyQ Safari welcomes new services which can bring amazing experiences for visitors. MyQ Vietnam has a 150 m2 souvenir store where we franchise logo and designs of the following brands: MyQ Safari, MyQ Vietnam, MyQ Resort, MyQ Amusement Park. 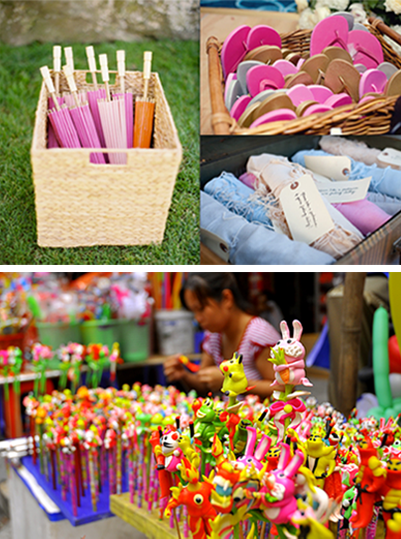 You absolutely use these brands to create hundreds, even thousands, of MyQ souvenir items. Research shows that 80% children and families want at least a Zoo souvenir item. It means this will be an effective investment. We welcome professional counters of balloon, to he and traditional toy placed along this area. This business needs only a little capital but it can bring an attractive profit. + Vietnamese premium cuisine restaurant: The restaurant is designed with big glass windows so visitors can see animals wandering outside. We welcome famous restaurants to invest in this sector so that the first time in Vietnam, guests not only enjoy exquisite cuisine but also experience exciting space. + Drinking Shops: placed in entire area to solve the drinking demand of families in MyQ Vietnam. 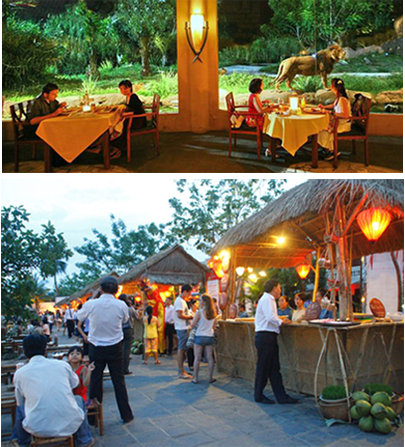 We welcome coffee shops and drinking stalls which want to provide water and beverage for MyQ Safari. 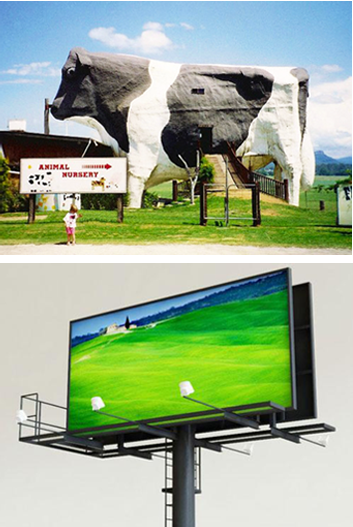 Let’s imagine that your branding ambience advertisement is associated with a zoo where approximately 6-8 million guests visit per year. 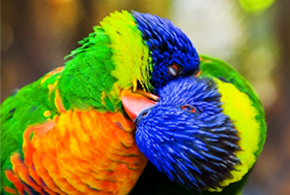 They not only look at your brand but also take part in zoo’s activities that you organized. + Happy Farm Area: Extremely suitable for dairy companies, food manufacturers and beverage for children. 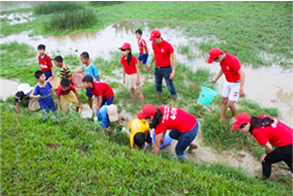 The Farm is a great place for your brand can organize activities of activation and education for customers. In the Farm, there are happy farmer and good game leaders who can introduce your product every day to visitors of MyQ Safari. + Pathways: Along the pathways, you can place your large advertising signs so that your brand can introduced widely to visitors of MyQ Safari. This is extremely suitable location for consumer brands targeting families and toy brands for children. This area is simulated northern villages. 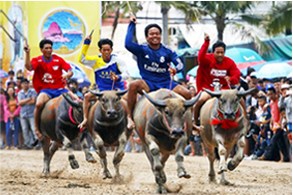 There are many interesting activities in The Northern Villages such as: see a buffalo race, ride buffalo to plow, crab and collect snails and discover animals familiar with northern of Vietnam included buffalo, chicken, boar, etc. 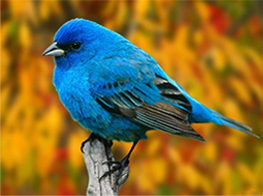 Beautiful bird garden is placed in this area. 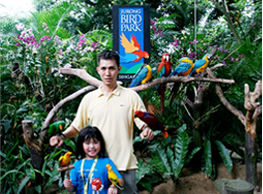 Children and families can explore various birds such as peafowls, robins, storks, parrots and many other kinds of rare birds. This area is simulated southern villages with ba ba shirts (a kind of traditional shirt of southern of Vietnam) and famous folk songs. 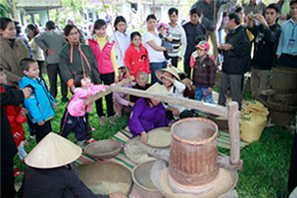 There are many exciting activities in The Southern Villages such as: mill rice, pound rice, feed chickens, plant flowers and trees, row boat on river, etc. 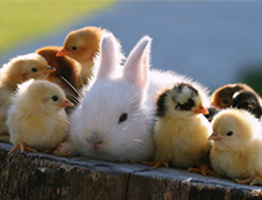 Children will get acquainted with chicks, pigs, fun cows and playful otters. 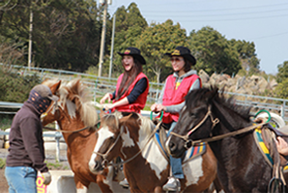 There are many educational and playful activities at Happy Farm. This area is simulated highland villages with stilts, big elephents, strong horses and naughty monkeys. 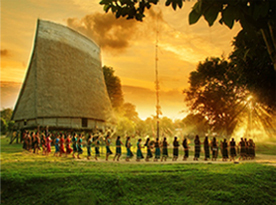 Children and families can take part in various activities, such as learning traditional dance, drinking traditional wine and ride horse or elephant like local people. The animal circus in this area has daily interesting shows. + Restaurants imbued national identities: This section has some small rustic food shops or small restaurants sell specialties of each region. We welcome specialty shop and restaurants.